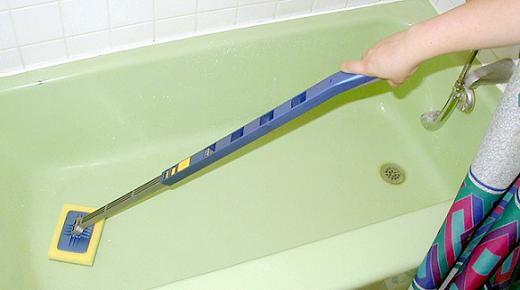 Are you tired of bending over to scrub the tub? This scrubber may be just the ticket. It has a telescoping wand, continuously adjustable from 34" to 55", and is not properly shown in the photo, which shows a previous (similar) model. The scrubber pad itself is rectangular, measuring 4¼" by 6", and consists of a rough-surface scrubble sponge. The neck of the scrubber that holds the sponge is flexible, to bend a little when scrubbing curved surfaces. Replacements pads are available. Tub scrubbers cannot be shipped economically by air. If you order a tub scrubber and specify either second day air or next day air, we will ship it by ground and refund the appropriate portion of the S/H charges that were billed to your card that represented the air portion of the charge. Because of the length and volume of the cartons that must be used to ship a tub scrubber, the air shipping charges from UPS become comparable to, or even exceed the cost of the item itself.